This is my contribution to the one day blog hop “Casting Light upon the Darkness”, organised by fabulous Helen Hollick. Please do not forget to hop onwards and upwards from this blog to the other participants’ blogs. Links provided at the bottom. In the Northern Hemisphere, today is the darkest day of the year. Tonight, the earth will creak and turn on its axle, shifting ever so slightly in its position, and already tomorrow the day will be a minute or so longer than it was today. Definitely an occasion for rejoicing – now as much as in previous times. The winter solstice was a feast our ancestors took seriously. The return of the sun, of its warmth, was a prerequisite to survival. Ancient monuments such as the Newgrange tomb indicate that this preoccupation with light was a major matter back then – as it has been throughout human history. Somewhere in that most distant of pasts, a spark was lit. Some say it was divine intervention, an all-powerful God commanding the stars, the suns and moons of the universe to begin to glow. “Let there be Light!” he pronounced, and the hitherto inky blackness of cosmos was lit by millions upon millions of miniature beacons of light. Others put it all down to Big Bang, a spontaneous collision of random material that shaped the universe as we know it – with the caveat that we know very, very little about the total universe, except that it is infinite and therefore incomprehensibly big. Anyway; from that first emission of light to the emergence of man there are eons of time, millennia in which the Earth was shaped and formed, when one life form after the other evolved. And then, some millions of years ago a little scraggly creature, Australopithecus Afarensis, rose on its hind legs and the first biped was born. Some more millennia and Homo Erectus stepped from the shadows I sometimes wonder if those first men were scared of the dark. Did they sit wide awake through the night, arms hugging their legs close, and hope the roaring lions would find other prey? Was it fear that had these ancient – and rather distant – ancestors of our expend effort on mastering the art of making fire? Or was it all a random event, lightning striking a nearby tree, a cocky adolescent laughing as his companions cowered back from the conflagration, striding forward to grab hold of a burning branch and wave it above his head? 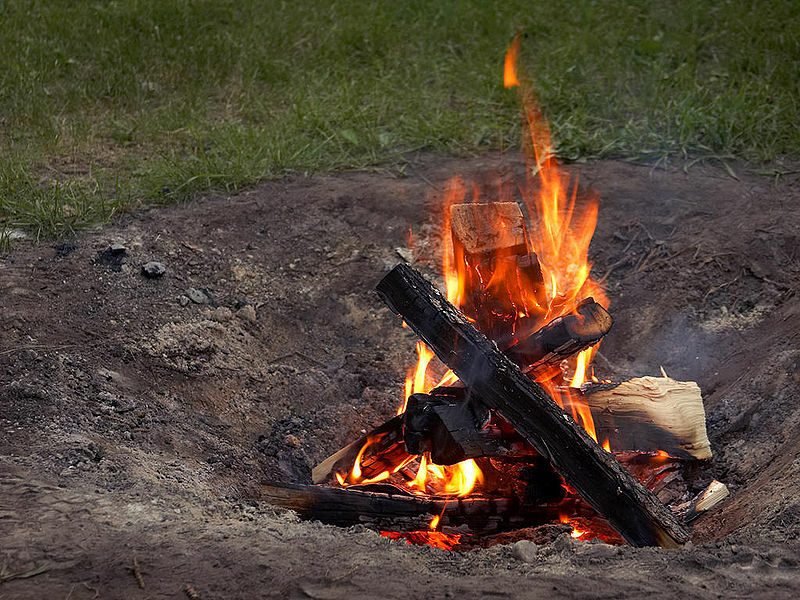 Or maybe they were just sick of eating raw meat, and decided it was time to have the first ever BBQ… Whatever the case, mastering the art of fire is one of the major achievements of primitive man, up there with the handheld tools and the development of a rudimentary language. Once man had conquered fire, there was a source of light in the dark, and so man moved up the housing ladder and became a cave dweller. 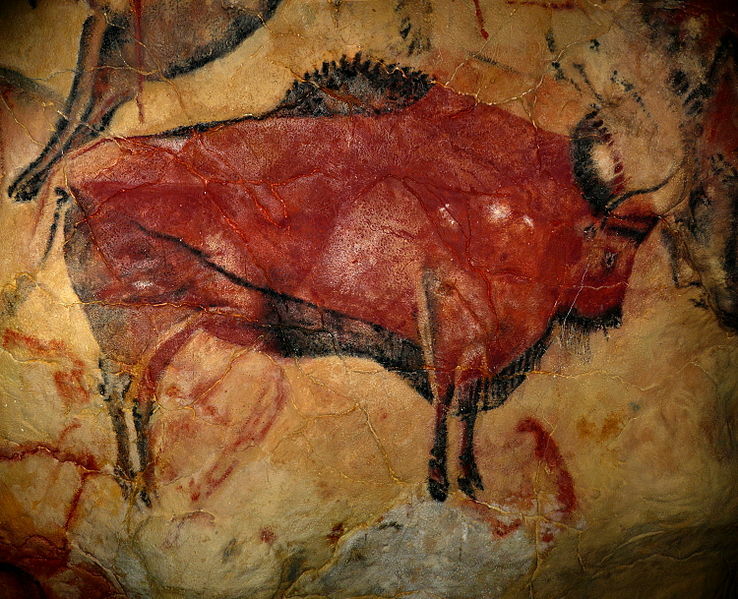 Once we were cave dwellers, man discovered art. A simplification, I know. Probably man had been doodling in the sand for ages, but what remains to us are the cave drawings. Walls that burst with life, with sticklike hunters and fleeing mammoths, with roaring lions and wild horses shrieking in desperation as they plunge over a cliff. Here and there we find the impression of a palm – several palms, an ancient “Kilroy was here”. Most of these drawings were made in the bowels of the earth, in the deepest, darkest parts of the cave – ergo, no burning torches, no art. Let us fast forward a bit, to the ancient worlds of Egypt or Mesopotamia. 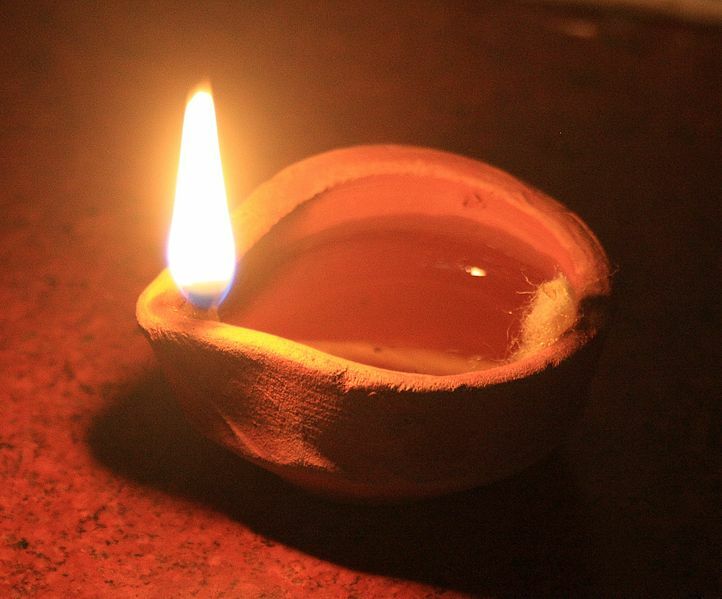 Now humans had oil lamps and lanterns, there were candles and torches – all of these inventions having the single purpose of extending light beyond the natural perimeters of day. Men (and women) would gather after dark – not to huddle in fear of lions, but to socialise, to tell stories. Indirectly, the availability of light had by now given us two of the more distinctive characteristics of our species , an appreciation of art and literature (as yet un-written literature). A traveller traversing the south of England in the 12th century would heave a sigh of relief when he made out the faint glimmers of distant light, a sure sign he was approaching some sort of dwelling, even a village. Back then, light was a luxury most humble people could not afford. Long winter nights were therefore best spent asleep, long summer days were savoured to the full. 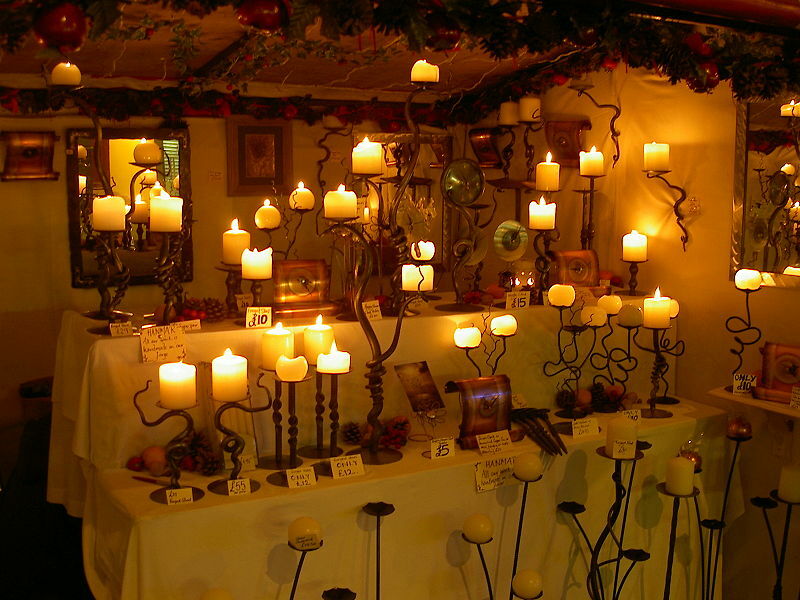 Candles were lit rarely, and mostly they would be made of tallow, filling the dark rooms with more smoke than light. But in the nobleman’s hall, torches burned brightly in scones, wax candles spread golden light over his table and family. Light had become a class marker. One of many, to be sure, but for those living in the darkened hovels, the light that spilled from the windows and doors of the castle was as unattainable as the horses the noblemen rode, or the jewels that adorned their clothes. Not only the nobles, but also the church had access to light – not surprising, as the church was as rich, if not more, than most noblemen. In the church, light was put to the service of education. Monks copied texts under the wavering light of a precious candle, other monks read and translated ancient texts – once again, with the aid of a candle. Some monks, I believe, became so entranced by some of the stuff they were reading that they may have sneaked back to the Scriptorium after dark, lit their candle and continued reading. And here we have the seeds of the reformation, as literate men began to question the authority of the church, the interpretation of the Bible. 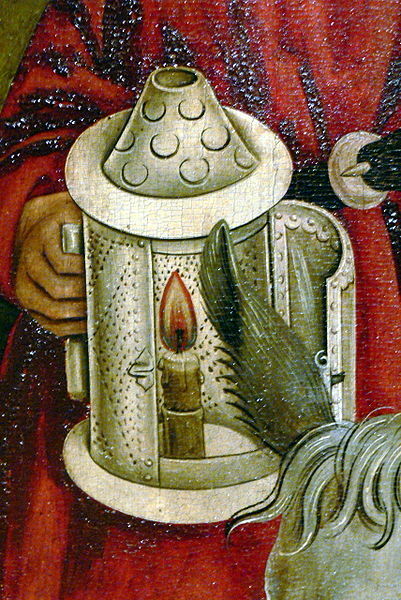 When Martin Luther – and I am convinced he was one of those monks that just couldn’t stop reading, stealing stubs of candle to use in his cell as he perused yet another forbidden text – banged his theses on the Wittenberg church door, he had no idea what havoc he was unleashing. A well-educated man, a devout man, he spent most of his remaining life fearing he’d be burnt as a heretic. 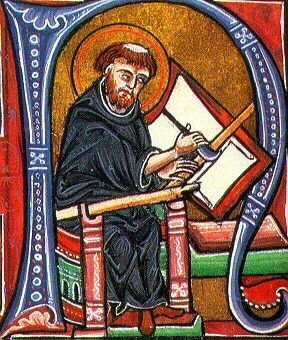 He also toiled for months, his efforts lit by yet another candle or two, to translate the Bible into the vernacular, thereby giving his compatriots the opportunity of reading Holy Scripture themselves, without priestly interpretation. As a consequence, more and more people learnt to read, eager to read first-hand what so far had been stories related to them by their priests. This is the great gift of the Reformation, that in its wake people were urged to educate themselves – at least a little – so as to be able to study the Bible. Of course, once people knew how to read, they began to read other things, and lo and behold, the Age of Enlightenment was upon us. Through all this upheaval, it was the flickering light of candles that illuminated the debates, the nightly work at one desk or another. 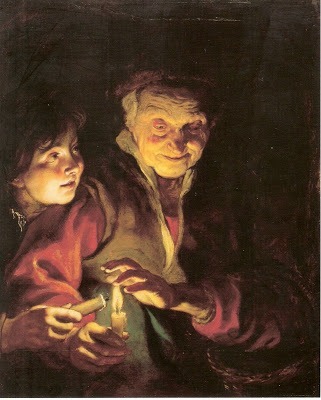 Common man discovered reading, tallow candles burnt through the dark, here and there enhanced by oil lamps, by rushlights. 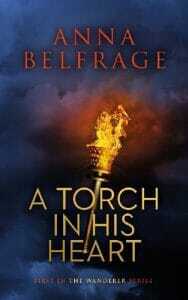 Light, people; it all came down to light, by now converted into a beacon of hope, of a future where all men were equal. It took some time – in fact, I’d argue we’re still not there – but today most men and women in the western world are raised believing in equality, in liberty. I find it very appropriate that the most emblematic symbol of freedom we have in the world, namely the Statue of Liberty in New York, holds a torch over her head. No light, no freedom. No light, no education. No light, no arts, no civilisation, no literature. “Let there be Light!” He said. In my opinion, one of the best things He’s ever said. ~~~~~~~~~~~~~~~~~~~~~~~~~~~~~~~~~~~~~~~~~~~~~~~~~~ Do not forget to visit the other participating blogs! 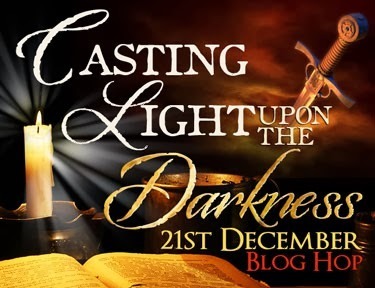 Prue Batten : Casting Light…. Alison Morton ‎ : Shedding light on the Roman dusk – Plus a Giveaway Prize! Anna Belfrage : Let there be light! Petrea Burchard : Darkness – how did people of the past cope with the dark? – Plus a Giveaway Prize! David Pilling : Greek Fire – Plus a Giveaway Prize! Earth turns on an axIS. I love your post. We’re lighting the fire in a few minutes and will spend long moments in reverie of the sheer power of fire and light upon this world. Thank you and happy solstice. Candles and a roaring log fire continue to be one of the joys of winter. It’s at this time of the year I feel sorry for people who don’t have a chimney! Ah yes. Let there be light. It is something we take for granted unless we’ve been victims of a power outage. And then we tend to see a few hours of darkness as fun. More than a few hours…. well…. Then we get irritated. We are so spoiled. Thanks for the reminder that things were once different. Lovely blog, Anna, it conjures some wonderful images of our ancestors, and also reminds us of the sheer power and miracle of light. Lovely post, Anna, and I love the eclectic mix of illustrations too. Hadn’t even thought about the Big Bang in this context (but I don’t have a very scientific brain). The Statue of Liberty is a great pic to end with – even though I’m British, I never fail to be moved by it. 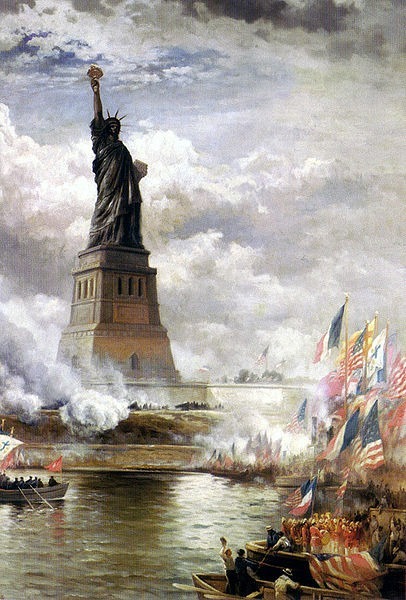 Glad you liked the post, and I agree, she is most evocative, Ms Liberty. Great post! We could run a whole series though, I reckon, on “emblematic symbols of freedom across the world” – maybe next time, eh? That could be fun – but somewhat restricted. Very interesting post, Anna! I gave to admit, I haven’t really given the history of light all that much thought before how, beyond how my characters used it in a given time period. Your piece was very thought provoking. Glad you liked it, Nicole. A lovely post Anna, no fire here, but the candles are lit. Wishing you a very Merry Christmas.